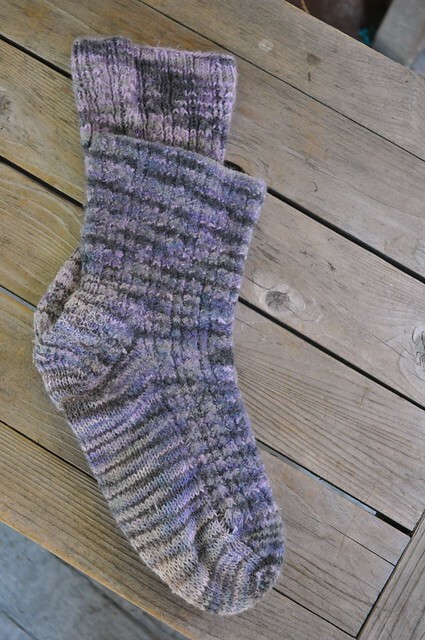 A very long time ago I knit myself the Conwy socks from Knitting on the Road (still my very favorite sock pattern book). I had two skeins of Lorna's Laces Shepherd Sock. They were two different dyelots. The color difference was always noticeable but I never really cared. Gradually though something happened. One sock began to shrink a bit every time I washed it (in the machine). The other stayed the same. Over the five plus years I've been wearing and washing the socks the difference has become *ahem* quite pronounced. Perhaps you can detect the difference? Boy that really Suxs! did you ever call LL? wow. You did get 5 years of wear out of them though. I'm lucky to get a few months' wear out of store bought socks. Ahhh... I had this happen once, too. The superwash was made by a coating on the wool, it eventually washed off of 1, and the yarn began to felt. Mine was a Brown Sheep yarn, circa late 90s. I had only cold-water washed mine (in the machine) and air dried, yet it began shrinking within 5-10 washes, so the coating was pretty poor quality, imo. The shrunken one looks like you tried to blend the dyelots by alternating skeins each row? The unshrunken one has pools of color from a single skein...Am I right? Wow, colour differences between socks I can live with. Shrinkage differences? How awkward. This is a great example of my one issue with trying out new yarn - you never know how it will wear over several years. Dye fading, yarn falling apart or felting. Everything has to wear that gets lovingly worn, but some things just aren't right. That's funny, my Conwys are made with 2 different dye lots of LL also. One of my favorite pairs of socks, from what is probably my favorite sock knitting book ever also.